To save a .doc file without opening, right-click (PC users) the link and select "Save target as". Results of Analisys and available Certificates on Cedar Nut Oil (Pine Nut Oil). Results of test completed by N.N. VOROZHTSOV NOVOSIBIRSK INSTITUTE OF ORGANIC CHEMISTRY OF THE SIBERIAN BRANCH OF RUSSIAN ACADEMY OF SCIENCE, Novosibirsk, Russia, 2017. Articles about the Ringing Cedars Series or on subjects related to the books. Dr. Pavel Pletner, proctologist, head of the Central Clinical Hospital of the Russian Academy of Sciences, Moscow, Russia, 2019 Beneficial Use of Cedar Nut Oil enriched with Cedar Resin in cases of Leaky Gut. Dr. Maria Kazakova,"Ural State Medical Academy", Ekaterinburg, 2012: Cedar Products for the preservation of the harmony of health in adulthood. Dr. Sergey Shirokov, PhD,"Clinical and Experimental Lymphology Scientific Research Institute", Novosibirsk, 2012: "Cedar Power" for improving the health of children and adolescents..
Dr. Andrey Belov, dietologist,"Moscow Center of Personal Dietology", Moscow, 2012: Cedar Nut Flakes are the best quality breakfast for any family. Full of plant protein, vitamins and minerals cedar nut flakes help maintain health..
Victor Rod, RingingCedarsofRussia.org, New York, 2012: Valentine's Day is just a blink away!. Nikolay Mechin, 2011: Cedar Resin: Nature's Miracle. Dr. Maria Kazakova, Ural State Medical Academy, Ekaterinburg, 2011: Ringing Cedars Oil Promotes Prolongation of Life. Dr. Maria Kazakova, Ural State Medical Academy, Ekaterinburg, 2011: Preserving the Harmony of Health at Maturity with Cedar Nut Oil. Victor Rod, RingingCedarsofRussia.org, New York, 2011: Holiday Gift Ideas. N. A. Agadzhanyan, PhD, Professor, Clinical and Experimental Lymphology Scientific Research Institute of the Siberian Branch of the Russian Academy of Medical Sciences, Novosibirsk, 2011: Gastrointestinal Tract Program. E. L. Poteryaeva, PhD, Head of the Department of Human Ecology and Occupational Diseases, Professor;N. G. Nikiforova, PhD, Professor in the Department of Human Ecology and occupational Diseases, Novosibirsk State Medical Academy Department of Human Ecology and Occupational Diseases, Novosibirsk, 2011: Use of Ringing Cedars of Russia cedar products for prophylaxis and improving the health of the population. V. Kononova Ph. D., Novosibirsk State Medical University, Novosibirsk, Russia, 2010: Antiparasitic Properties of Siberian Cedar Nut Oil enriched with Cedar Resin. Dr. L. V. Sviridova, Obstetrician and Gynecologist, Municipal Hospital No. 3, Municipal Health Care Facility, Barnaul, 2010: The Impact of Cedar Nut Oil on Woman's Health. Nadia Kern, Homeopath and Massagist Toronto, Canada, 2010: The Story Behind a Cedar Spoon. Victor Rod, RingingCedarsofRussia.org, New York, 2010: Holiday Gift Ideas. Yu. V. Bakhtin, V. V. Budaeva, A. L. Vereshchagin, E. Yu. Egorova, E. E. Zhukova, A. S. Saratikov, Biysk Institute of Technology, I. I. Polzunov Altai State Technical University, Biysk, 2009: PROPHYLACTIC NUTRITION: EFFECTIVENESS OF USING SIBERIAN CEDAR NUT OIL IN THE COMPREHENSIVE TREATMENT OF PATIENTS WITH ARTERIAL HYPERTENSION. V. Rezin Ph. D., Institute of Climatic and Ecological Systems Monitoring, Novosibirsk, Russia, 2009: Cedar Nut Oil - What beneficial properties does it possess? M. M. Ignatenko, 1981: Siberian Cedar - Tree Benefits. CedarInfo.info: About Siberian Cedar (Pine) Essential Oils. Taiga Magasine, 2006. INERVIEW WITH VLADIMIR MEGRE. Zarrin McDaniel Leff, NSCA-CPT. Siberian Cedar Nut Oil - Biophotons, ORMUS Minerals, Polyunsaturated Fatty Acids. Regina Jensen, Ph. D., 2009. Why do boxer Vasily Jirov, wild wolves and savvy health consumers all cherish Siberian pine nut oil? Interviews with Vladimir Megre - by Regina Jensen, Ph. D., 2008. 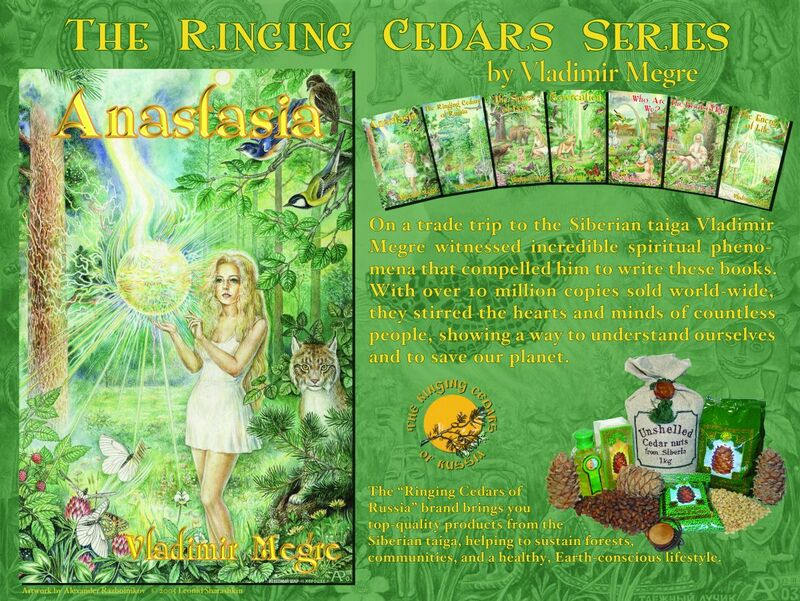 Exclusive interview with Vladimir Megre From the 2008 Ringing Cedars Conference in Turkey. A. B. Krivosheev, 2008. REPORT Of a Clinical Trial of Siberian Cedar Nut Oil Bearing the Ringing Cedars of Russia Trademark in the comprehensive therapy of digestive, stomach, and intestinal disorders. By A.B. Krivosheev, Professor of the Department of Internal Medicine, Doctor of Medical Sciences, Presented by CedarInfo.info on November 12, 2008. Regina Jensen, Ph. D., 2008. Ringing Cedars - Food for Hope: A Global Vision for an attainable, sustainable future. Interviews with Vladimir Megre - by Regina Jensen, Ph. D., 2008. Exclusive interview with Vladimir Megre for THE EARTH Newspaper - PART II. B.M. Doronin, Ph. D., 2008. EFFECTIVENESS OF USING SIBERIAN CEDAR OIL IN THE COMPREHENSIVE TREATMENT OF NEUROTIC DISORDERS. Interviews with Vladimir Megre - by Regina Jensen, Ph. D., 2008. Exclusive interview with Vladimir Megre for THE EARTH Newspaper. CedarInfo.info, 2008. Siberian Cedar Seed Reproduction. Interviews with Vladimir Megre, 2002. Excerpt from the speech of V. N. Megre in Zurich (Switzerland). Yarinka.ru, 2008. What is cedar nut oil for? Articles written by Vladimir Megre, 2003. Why doesn't Anastasia go on public television? Interviews with Vladimir Megre, Tatyana Barabash, 2003. Vladimir Megre's Confession. Sergei Dlinnorukiy, 2007. SIBERIAN CEDARS. Vozrozhdenie [Revival] Foundation, 2006. Essential Oils Bring Nature Closer. V.P. Zhuravlev, 2006. Is the Cedar a model of human body? R. Bobrov, 2006. Cedar - the bread tree. "Open Mind" Organisation, 2005. THE CEDAR NUTS A TREASURE-HOUSE OF USEFUL SUBSTANCES. John Woodsworth, 2006. Links Across Space and Time. Vasily Jirov, 2006. What is today's sporting elite thinking about? CedarInfo.info, 2006. Cedar the Healer. Nadia Kern, 2005. Cosmetological properties of Cedar Oil produced by the original cold-pressing technology on wooden presses. Presented by Nadia Kern, Registered Massage Therapist, Toronto, Canada, December 15, 2004. Naianika Krishna, 2000. Pranic healing: Experimentation for determining the effect of cedar nut oil on health-governing energy chakras and on the overall improvement of bodily energy. Presented by public organization "PILGRIM FOUND" Ekaterinburg, Russian Federation, May 12, 2000. F. Saleev, and A. Shardakov, 1992. NATURAL MEDICINE: Therapeutic application of cedar nut oil in a group involved in the clean-up of the Chernobyl Atomic Energy Station in 1986–1987. Presented at the Tomsk Division, Chernobyl Union, Tomsk, Russian Federation, June 10, 1992. E.I. Filchenko, S.V. Nizkodubova, V.I. Karpitsky, and A.G. Petrenko, 1995. NATURAL MEDICINE: The use of cedar nut oil in the treatment of gastritis, erosive stomach and duodenal ulcers. Presented at the Tomsk Scientific Research Institute of balneology and physiotherapy of Ministry of Health of the Russian Federation, Tomsk, Russian Federation, November 15, 1995. http://niikf.tomsk.ru. Books in the Ringing Cedars Series have been translated into 20 languages and new translations appear every day. Below are the covers of some of the translations.